Indian E-Commerce Battle Continues; Amazon Tied With Flipkart At No. 1! Flipkart has a higher market share in Tier-II and Tier-III cities, whereas Amazon is making it big in the Tier-I cities and metros. The ecommerce industry in the country has come a long way. India’s top online ecommerce players, Flipkart and Amazon continue to rule the market. Both these e-commerce giants remain the most preferred online shopping destinations followed by Snapdeal, Paytm and others. Flipkart has a higher market share in Tier-II and Tier-III cities, whereas Amazon is making it big in the Tier-I cities and metros, according to RedSeer E-tailing Leadership Index (ELI). Flipkart and Amazon continue to dominate the market. But, the competition between the two is getting closer day by day. Both of them have seen a slight decline in their overall sales in the last few quarters. 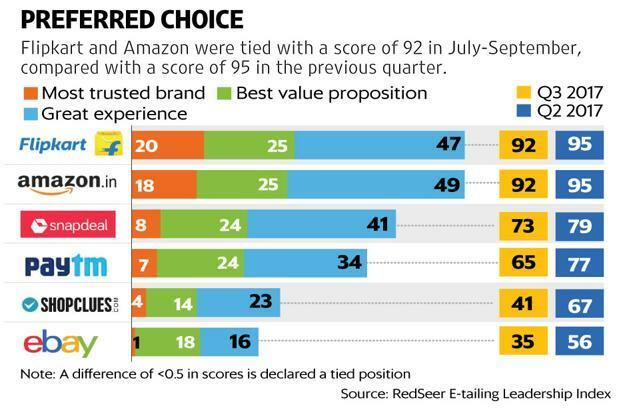 As per reports, Flipkart and Amazon have tied with the same score for the July-September Q3 period. The July-September period coincided with the festive sales from both, Flipkart and Amazon. The festive period offered much bigger volume of orders, and both the companies fared really well across sectors, during the season. Top e-commerce retailers like ShopClues, Paytm, Snapdeal and eBay India experienced a deep decline during the same period. Snapdeal stands at third, followed by Paytm, who is presently focusing on a remodel with their branding and working on the customer satisfaction metrics. ShopClues and eBay India (owned by Flipkart) stand at four and five in the table respectively. Once a topper in the overall sales table, today Snapdeal has lost out in a big way in the sector. It’s surprising that Snapdeal still continues to do well in the index in spite of being forced to cut costs and conserve cash after a sale to Flipkart fell apart in August. The online shopping major has spent mostly on marketing in the last five years, and the situation is getting worse for the company. RedSeer has surveyed around 7,500 online shoppers from 30 different cities from the period from July to September, and they kept a track of the prices of various items across top e-commerce firms in the country, which also include Paytm and ShopClues. RedSeer has analysed 30 different parameters to arrive at the given rankings. Amazon is currently holding a major edge over Flipkart in Tier-1 and metro cities, where e-commerce is huge. Amazon’s popular subscription programme Prime has been a major component responsible for pushing their sales. Prime has helped Amazon India to perform better in the last 3-4 quarters. The service has drastically helped improve the perception of delivery experience among customers. Today Prime members account for around 30% of all the orders placed on Amazon India. Flipkart too has a similar Flipkart First subscription service for their customers, and are also looking to launch a content service like Prime. Both, Flipkart as well as Amazon, are extremely well-funded and have received heavy investments from major investors. In the last four years of business, the Jeff Bezos backed Amazon has invested aggressively in Amazon India and has spent around $5 billion to grow their business in the country. Amazon India has nearly doubled its authorized capital to Rs. 31,000 crore ($4.74 billion) till now. Since it’s launch in 2013, Amazon has invested four times in their Indian marketplace, which has helped them with a wider selection of products, offer competitive pricing and to build a network for faster deliveries. On top of it, Prime offers streaming video and music services with the same subscription. The company also recently launched their Echo range of speakers in India. Flipkart also raised a mammoth funding from SoftBank’s Vision Fund of around $4 billion in cash, which comprised a capital infusion of $1.4 billion and another $1.2 to 1.4 billion were in secondary share purchases. "Indian E-Commerce Battle Continues; Amazon Tied With Flipkart At No. 1! ", 5 out of 5 based on 2 ratings. CBSE Makes Aadhaar Mandatory For JEE Mains Exam; Now Register For Marriage Using Aadhaar!